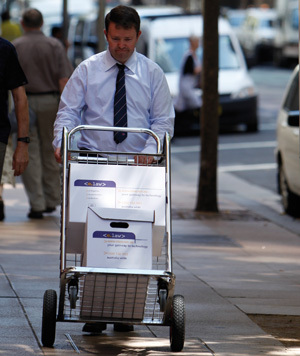 Police briefs that could run up to 10,000 pages were causing headaches for the Office of the Director of Public Prosecutions (ODPP) for Western Australia, which has found relief in a paperless workflow utilising Kodak scanners and EzeScan software. The ODPP is responsible for the prosecution of all accused people charged with indictable state offences in WA’s higher courts. State Prosecutors employed by the ODPP undertake high profile criminal prosecutions, in jurisdictions from the Magistrates Court, and Children’s Court up to the High Court of Australia. The ODPP must deal with a huge number of documents of varying types. This can include letters, court documents, police briefs and other associated evidentiary material. By far the largest volume of documents are the police briefs which contain witness statements, transcripts, exhibits, certificates, forensic reports, incident reports, bail papers and other types of police material. Depending on the complexity of a prosecution case, these vary in size from 250 pages to 10,000 pages. When you factor in that the ODPP receives over 3000 police briefs per annum, the challenges of managing paper-based records become apparent. On the frontline dealing with this mass of paper documents are six records management staff that now create files, index, scan and catalogue documents into the ODPP’s electronic records system. The ODPP began a move to electronic records in 2009 with the acquisition of HP TRIM CONTEXT 6.2.4. Scanning of Police briefs and associated documents began in February 2010 using three Kodak i1440 scanners. "While our Kodak scanning equipment could scan the associated documents into a single PDF document, this would not provide flow-on benefits to our paralegals and prosecutors," said Valter Guarino, Manager Records at the ODPP. Other priorities included improved accountability, transparency, timeliness and security of records. To this end, the ODPP initially began using EzeScan software to assist with the scanning of various documents, using barcoding, zone recognition and purpose designed job templates. This provided improvements in efficiency, accuracy and timeliness. Guarino then approached Outback Imaging to discuss a solution for dealing with police briefs. A solution was developed based upon predesigned barcode sheets that divide the Police Brief by the various different document types. These sheets also provide the information used to title the individual documents in HP TRIM. The sheets also trigger different indexing questions for the specific document type, with all default metadata automatically applied by EzeScan by undertaking a database reference to the ODPP's form information database. "We proceeded to test the EzeScan application on various briefs and we quickly found that the solution was workable and would provide the organisation information in the required structure and formatting," said Guarino. "Using the barcode sheets and zone recognition through EzeScan, we reduced keystrokes and improved accuracy. The EzeScan solution from Outback Imaging perfectly suited our needs. “It was a simple deployment with out-of-the-box connectivity with our Kodak scanners and HP TRIM." "The use of barcode cover sheets which contain the TRIM folder number and the document type in the brief has now been expanded to scanning other documents. At present we are using 25 of these sheets. This solution has increased our productivity and improved timeliness, and we are now looking at enabling other divisions of ODPP to use the technology to help our business in the battle against paper.